Opposites attract. Black flatters white. Dark enhances light. Yin highlights yang. One of our Trump Tower homes most elegantly reflects this philosophy. While the architecture of Trump’s ultra sleek exterior mirrors perfectly today’s contemporary aesthetic, we have assembled a spectacular collection of one-of-a-kind antique finds to achieve eye-opening decorative touches. Where else could a seriously whimsical (how’s that for opposites?) “surprise” chair fulfill an erudite homeowner’s desire to honor history? Its secret compartments galore bear Queen Victoria’s Royal Warrant cipher. This chair, complete with crystal decanters and an assortment of glasses, serves as the bar in the home theater. However, who knows what additional 21st century trinkets will find a home in its remarkable cubbies. The home theater features upholstered walls and crotch mahogany paneling which frame the large screen television. 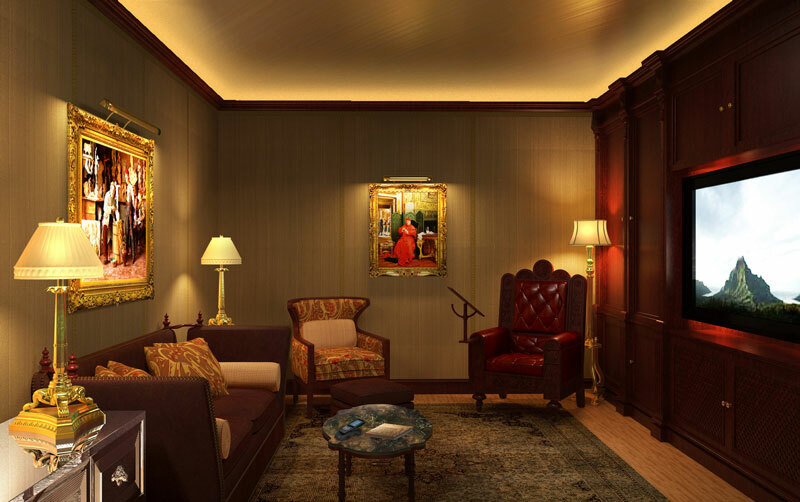 Energy efficient lighting, concealed by dropped crown molding illuminates the gold leaf ceiling. 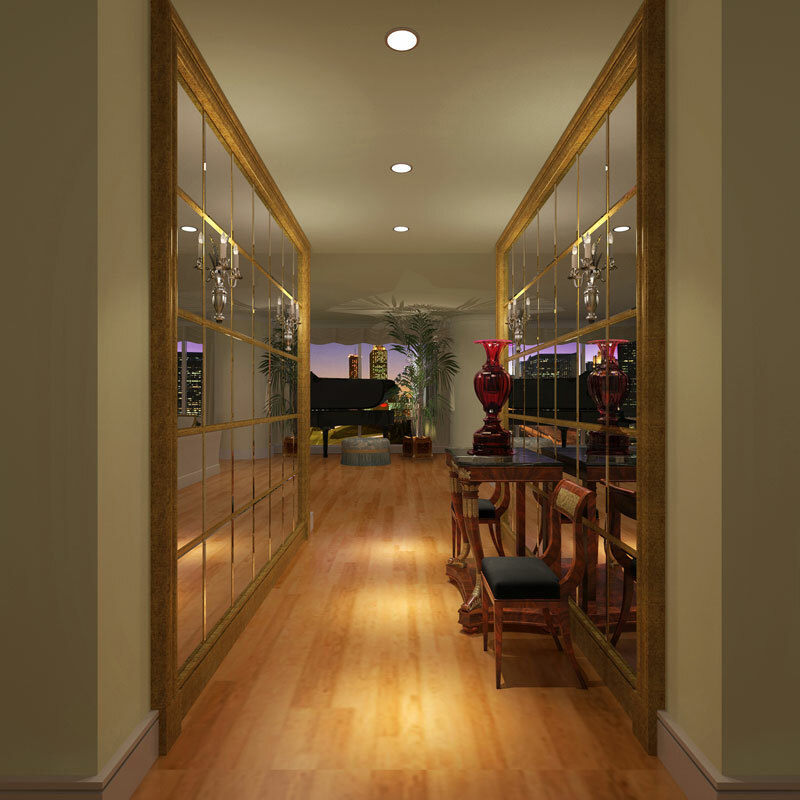 We created gilt framed mirrored walls to heighten the drama and glamour of the home’s welcoming entry, adding hand-cut crystal sconces for sparkle. A pair of extraordinary Biedermeier chairs flank a marble topped console. The perfect jolt of color emanates from a mid-19th century Bohemian glass vase. 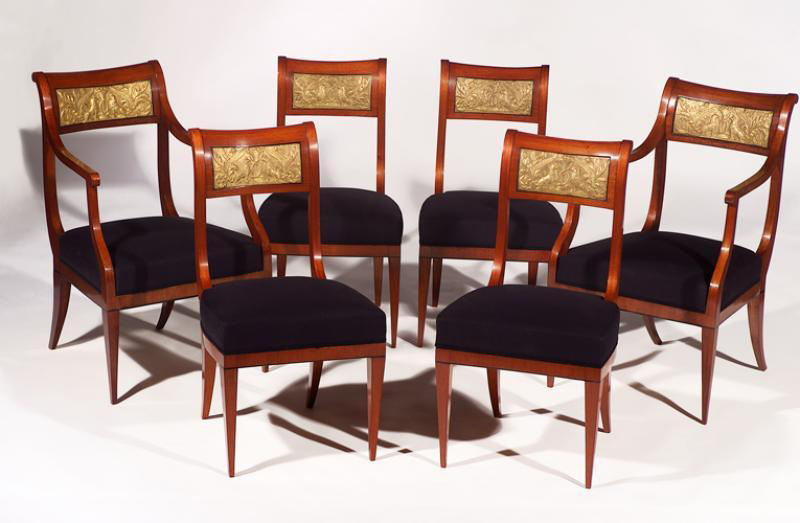 Cherry veneer Biedermeier chairs (circa 1820) sport backrests with gilt stucco griffin reliefs representing the pinnacle of Neoclassicism. Friends and family would need to travel to the Munich, Germany royal palace of Ludwig I and his wife, Therese, to see similar seating. A Regency styled marble fireplace mantel and Sabino frosted glass art deco chandelier compliment the museum-worthy chairs. Once again, we are proud of our ability to integrate art, architecture, and design into this private residence. Thank you for your continued support of John Robert Wiltgen Design, Inc. Have the greatest summer!!! ©2010 John Robert Wiltgen Design, Inc. All rights reserved. Thank you for sharing! Amazing restructure and use of the space! can I get one of these? Awsome.. I love your emails. Thanks for sharing. Congratulations on yet another wonderful design project. Thank you so much John for sending me this fabulous installation. I could live there!!!!!. Best Wishes for continued success. That is magnificent! You are a design genius! You are the Master! All I can say is WOW! It is so exciting to see the transformation of these units into the extraordinary homes you create with your designs. Thanks for sending the eye candy. 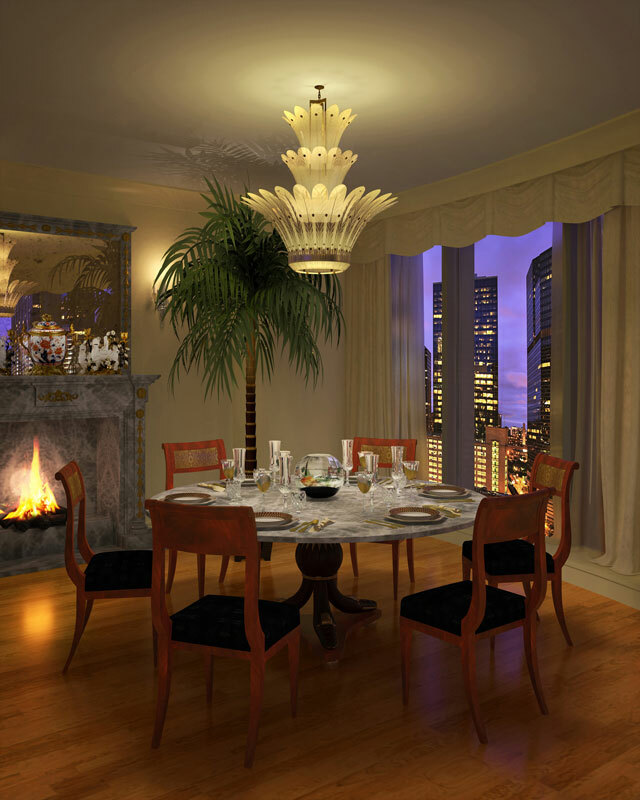 The dining room is to absolutely die for….gorgeous. I would KILL for that chair…what a find and every room is a masterpiece. Congratulations…you are obviously the best!